This line is open. Passenger services are provided by ScotRail from Inverness to Perth, Glasgow and Edinburgh. First passenger train approaching Broomhill in nearly 37 years. The river is the Spey. This line crosses an area with little population except at Aviemore, Kingussie, Newtonmore, Blair Atholl and Pitlochry. The portion from Dunkeld to Struan follows rivers in valleys with small towns. The section from Struan on to Newtonmore is quite wild crossing peat moss and high ground. From Newtonmore to Aviemore the route is less remote and similar to the southern section. The line is paralleled by the A9 road. The Inverness and Perth Junction Railway made an end on junction here with the Perth and Dunkeld Railway. This passing loop is closed. The photograph above shows a northbound train approaching its former site. This was a two platform station with a passing loop. The station is closed and the loop track lifted. The platforms remain along with the station building. This was a single platform station on a bend in the line. The station is now closed but some railway fencing which backed the platform remains. This was a three platform station. The station is now closed. The main line part of the station had two platforms with a passing loop (loop now lifted, although it survived closure of the branch line). The branch platform (this was the junction for the closed Aberfeldy Branch) had a passing loop. All platforms have been removed and only the base of the south signalbox remains. This passing loop was to the south of Pitlochry. It is now closed. There is a level crossing at the site of the loop. This passing loop was recently the scene of a accident between a car on the level crossing and a train. The level crossing design may be altered. This is a two platform station with a passing loop. The goods shed shown above is now demolished, but a siding remains. The station retains its fine main buildings, footbridge, north signalbox and wooden platform extensions to the south end. Pitlochry is quite a large town/village with many hotels and a theatre. This was a double platform station with a passing loop. The station is now closed, platforms removed, building demolished and passing loop lifted. The road bridge over the site remains. This station has two platforms and marks the south end of a double track section. It boasts a large goods yard (mostly used by permanent way trains) and a large disused engine shed. To the south the line is single track and to the north double, the whole way to Dalwhinnie. The main station still stands, although it has lost a wing, the northbound building (seen in the top right photograph) also stands along with the footbridge and south signalbox. The station served the castle at Blair Atholl and the small village/town which was associated with it. The original station was quite basic but was re-built in a fine fashion complete with a waiting room for the Duke of Athole. This was a halt to the north of Blair Atholl. It is closed and no trace remains. This was a two platform station. The platforms remain but the station is closed. To the south there are two fine railway bridges which cross a road bridge which in turn crosses a river. There are two railway bridges because the line was originally single track here. The original bridge is in stone, the new in steel. This box is closed and removed. This box remains, clad in metal sheeting, a ground frame remains here controlling a crossing from the southbound track (points facing south) to the northbound track (points facing north). This box has been removed. This was a two platform station. The station is now close. The signalbox remains standing, but out of use. The station building (seen above on the right) has been re-located to Aviemore Speyside station. At the time of this photograph this station was a passing loop on the single track line between Blair Atholl and Dalwhinnie - the line had been singled in the 1960s, but has been re-doubled. This is one of the summits of the line at 1484 feet. The line is double track at this point and boards on either side of the line inform passengers where they are passing. This section of the line has a few surfacemen's cottages, many disused like the ones just to the south of the the summit. This is a two platform station. To the north of the station the line is single track (although a second track ran parallel to the main line for some distance to serve the Dalwhinnie Distillery, the photograph was taken in this section and the right hand track serves the distillery. This track has been lifted.). The station building, footbridge and north signalbox still stand. There was a house by the station which burnt down, but is being replaced. This loop and signalbox are removed. This was a two platform station with a passing loop. While the station remains open, only one platform remains and the loop has been lifted. The station building is now a house and the platform by it removed. The southbound platform building remained in place after the track by the platform was removed. It has now been removed and is privately owned. The goods shed and sidings have been removed. This is a two platform station with a long passing loop, footbridge, northbound station building, new southbound waiting shelter and north signalbox. The station building was built behind the original building which was subsequently demolished on completion of the new building. The signalbox here is closed, but the passing loop remains open and is controlled from Aviemore. This station was re-built when the direct line to Inverness opened (The Aviemore and Inverness Direct Railway left the line at this station). In the 1960s the original route via Grantown was closed. 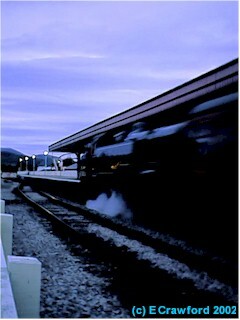 It is now preseved railway running from Aviemore, via Aviemore Speyside and Boat of Garten to Broomhill. There are plans to extend this to Grantown. I've been told by an old signalman that during the run-down of the Grantown route passengers were made to buy two tickets - if one wished to travel to Perth a ticket from Grantown to Aviemore and second one from Aviemore to Perth. This inflated the tickets sold from Aviemore and the Grantown tickets could be brushed under the carpet. When the Grantown route closed, ticket sales also dropped. Aviemore is now quite a large town, having been converted from a railway junction town to a resort by skiing and the building of hotels and restaurants. The station has been renovated and now plays host to the preserved trains running to Boat of Garten and beyond, leading to the closure of Aviemore Speyside. Train heads from Aviemore Speyside to Boat of Garten. 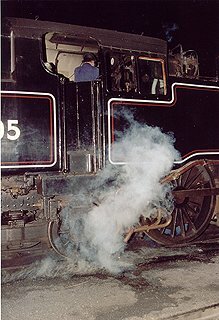 Steam engine returns to shed at the end of the first day of public trains to Broomhill in 30 years. The station was built by the Strathspey Steam Railway as British Rail would not permit access to the unused platform at Aviemore. 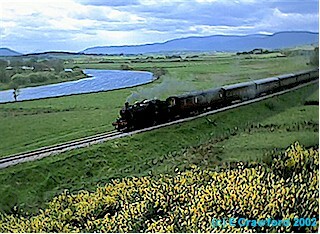 The line from here to Boat of Garten is operated by the Strathspey Steam Railway. The station building here was removed from Dalnaspidal station. The station has now been closed since Aviemore proper has been re-built to allow the Speyside line to use it. This was the junction for the Strathspey Railway which ran to Craigellachie and Dufftown. This was the terminus of the Strathspey Steam Railway but work is progressing to extend the line from Broomhill to Grantown (West). There was an engine shed to the north of the station. This was the point of divergence for the Strathspey Railway. The lines ran out as single track from Boat of Garten; this reduced costs as a signal box was not necessary at the junction. Famously the two lines had different colours of ballast, running side by side. This station was largely demolished leaving only the platform and stationmaster's house. The Strathspey Steam Railway has re-conditioned the station and the line to Boat of Garten re-laid. Broomhill re-opened on 31/06/2002. This is presently the terminus of the line. This station has been demolished and the platforms infilled leaving only the stationmaster's house. This may become the terminus of the Strathspey Railway which runs from Aviemore to Broomhill at the time of writing. This halt was incorporated into the highly decorated combined railway bridge and gatehouse for Castle Grant. This was the highest point on the line. Burnt snow fences remain here. This station had two platforms and a passing loop. Although long closed, the platforms, station buildings and staff houses remain standing. The base of the north and south signalboxes can be found. The platforms were very long. To the north and south of the station trains were snowed in. This substancial viaduct stands to the south of Dunphail station. This was a two platform station with a passing loop. The platforms partly remain, overgrown, to either side of the station building which is now a house. The goods loading bank remains to the north of the station. The platforms were very long. This station was opened with the line, but closed very shortly afterwards. The wooden building was moved to Aberfeldy as the station building, although it was later replaced in stone by a building similar to that at Pitlochry. Although the line is closed here, a track remains within the confines of the Dallas Dhu Distillery, now also closed and presently a visitor's centre. 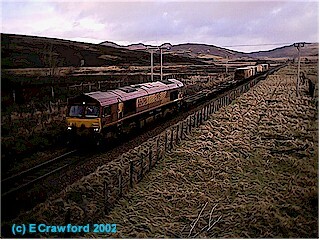 The line joined the Inverness and Aberdeen Railway in a triangular junction at this point. The station was located within the triangular junction.